Αξιοποιήστε στο έπακρο αυτή τη μοντέρνα και ευρύχωρη θερινή κατοικία. Απολαύστε ειδυλλιακά ηλιοβασιλέματα και απολαύστε απόλυτη ησυχία και άνεση μαζί με την υπέροχη πανοραμική θέα στο Αιγαίο Πέλαγος. Βρίσκεται μόλις 5 λεπτά με τα πόδια από μια όμορφη αμμώδη παραλία με βότσαλα. Ιδανικό για οικογένειες και ζευγάρια που επιθυμούν να χαλαρώσουν, να κολυμπήσουν / κολυμπούν με κολύμβηση σε καθαρά κρυστάλλινα νερά, να δοκιμάσουν τοπικά φαγητά και να εξερευνήσουν την ποικιλομορφία της Καρύστου. Διαθέσιμη πολύ καλά εξοπλισμένη κουζίνα, μπάρμπεκιου με φούρνο με ξύλα, μεγάλη περιοχή χαλάρωσης και ιδιωτικό παρεκκλήσι εντός του κτήματος. Παρέχονται πετσέτες μπάνιου και πετσέτες θαλάσσης. Nous avons reçu un très bon accueil attentionné de la part de Pavlina et sa maman. Leur maison est spacieuse, très belle, bien entretenue, agréable à vivre, très bien équipée, très propre et vous offre une vue dont vous ne vous lassez jamais du matin au soir ! Une petite plage à 10 minutes à pied, d'autres à quelques minutes en voiture, et le centre à moins de 10 minutes. Emplacement parfait et calme absolu. Dear Anne-Laure, it was our pleasure to host you and meet you in person. You are a wonderful family and we hope to see you again next summer! Au revoir! Die Unterkunft entspricht in vollem Umfang den Bildern und der Beschreibung. Das Haus gehört einer Athener Familie, die es selbst als Sommerresidenz benutzt. Der Kontakt war von Anfang an sehr freundlich und problemlos. Alle Fragen wurden von den Besitzern beantwortet und alle Wünsche erfüllt ( keine Agentur oder Ähnliches). Das Haus selbst liegt sehr ruhig und malerisch über dem Meer. Dadurch hat man eine phänomenale Aussicht auf den Ozean. Der perfekte Ort zum Entspannen. Das Haus ist voll klimatisiert und gut ausgestattet. Sogar Strandtücher, Shampoo und Duschgel sowie Grundausstattung zum Kochen (Öl, Essig, Salz, Pfeffer, Gewürze, Spülmittel u.s.w.) sind vorhanden. Sogar der Kühlschrank war schon mit Grundnahrungsmitteln und griechischen Spezialitäten gefüllt als Willkommensgruß. Wir können das Haus uneingeschränkt und zu 100% weiterempfehlen. Wir haben es mit vier Personen genutzt. Eine Nutzung mit bis zu 6 Personen ist problemlos möglich. Der nächste Ort ist 10 Autominuten entfernt. Im Umkreis von einer Autostunde findet man zahllose wunderschöne und auch in der Hauptsaison einsamen Buchten, Wälder Schluchten Wasserfälle etc. Unsere Lieblingsbucht liegt direkt unterhalb des Hauses und ist in 3 Minuten zu Fuß erreichbar. Die Hausbesitzer waren jederzeit erreichbar und konnten uns mit vielen wertvollen Tipps versorgen. Dear Jan, thank you for your detailed review and the nice contents. You are a great family and excellent guests that any property owner would love to host. We hope to see you again soon! Well equipped house big terrace and several places around the house to have a peaceful time. Dear Maure, it was our pleasure to host you and your family. You are a wonderful family and we would love to see you again any time you wish to come back! Thank you for your review and the comments submitted. La maison est facile d'accès depuis le port de Raffina (compter 1 heure de traversée), les propriétaires sont même venues nous accueillir à notre arrivée en bateau à Marmari. J'en profite pour saluer ici leur gentillesse, leurs grandes disponibilité et réactivité quelle que soit votre demande. La maison est à la fois fonctionnelle, très bien orientée pour profiter de l'ombre et de la vue et la décoration très raffinée.Nous étions 4, mais elle est tout aussi confortable pour 6. Le jardin, très bien entretenu, sera apprécié des enfants. La plage est effectivement à 5 mn à pied, et en plein mois d'août nous étions bien souvent tout seuls! La "grosse" ville Karystos est située à 10mn en voiture. Vous y trouvez absolument tout. C'est un bonheur de flâner le soir, vous n'avez que l'embarras du choix pour prendre un verre ou manger. Nous avons rencontré très peu de touristes étrangers, mais essentiellement des grecs. Nous n'attendons qu'une prochaine opportunité pour y retourner! Dear Herve, really happy that you and your family enjoyed the property and the city of Karystos. Looking forward to seeing you again and offer you our best hospitality. We had a fabulous restful holiday in this beautiful villa. 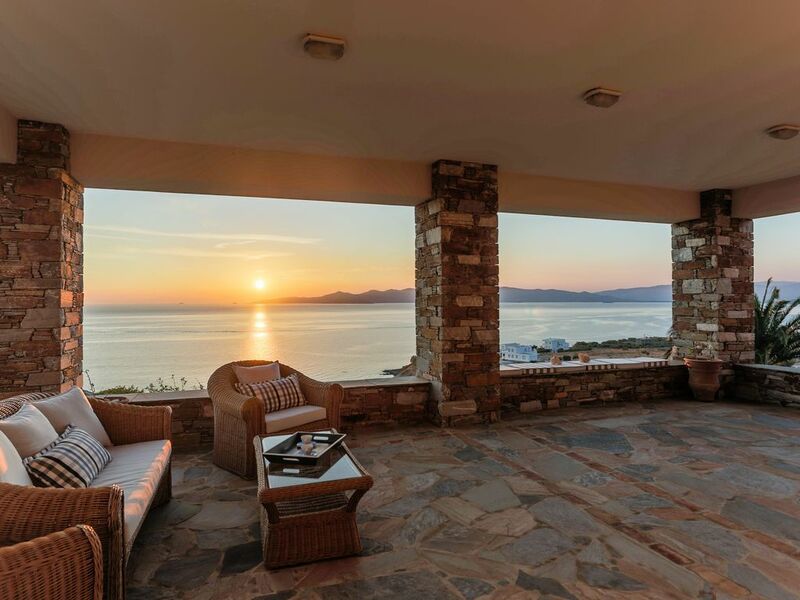 The views are spectacular, the villa extremely comfortable and only a few minutes walk from a lovely quiet beach. Pavlina and her family were so friendly, very helpful and we felt so welcomed. Thank you so much! The property was very clean, well maintained and has absolutely everything you need. We would very much recommend this as a great place to go to relax and unwind in glorious surroundings. Dear Jane, very happy to hear that you and your family enjoyed our hospitality and every single aspect of our property during your last summer holidays. Thank you for recommending our property to potential visitors. Comfortable spacious villa in a stunning setting! The grounds were huge and well-kept. The villa was thoughtfully and tastefully furnished. We thoroughly enjoyed the outdoor barbecue area. The beach a few minutes below us was practically private - we only saw a few other folk there during our entire two week stay. Dining and living area had a wonderful double aspect - looking out over the sea on one side and up to the craggy heights of Mount Ochi on the other. Karystos was a short drive away where we could get our groceries and where we could eat out. This part of Evia island only has local tourists coming across from Athens on the weekends which we thoroughly enjoyed. The ferry crossing was very straight-forward so we had enthralling day-trips to Athens and Corinth. Climbing Mount Ochi was challenging but the views were stupendous. We also appreciated going along to St Nicholas Greek Orthodox Church on Sunday. Overall we had a wonderful, thoroughly relaxing time and were very sorry to leave. The owners were warm, friendly & quick to respond to our questions. Some things to mention. Originally the villa description included a bath. This was a key factor in our choice (we worked in the tropics for the last 10 years without a bath). However, we discovered no bath. The owner was very apologetic ("lost in translation"?) and the web description of the villa was changed immediately. We also realized there was no DVD player. The owner had one couriered to us urgently. There was also no kettle (although the description of the villa didn't mention one) so making tea was awkward, although there was a lovely coffeemaker. The owners also couriered through a kettle but unfortunately this was a travel-sized one which wasn't a huge help so we stuck to boiling water in saucepans. One of the upstairs bedrooms is not air-conditioned. Normally this would not be a problem as one could simply sleep with the window open. However the first week of our holiday, the whole region experienced very high winds, day and night. The windows could not be opened and with them closed the third bedroom was too hot. Putting air-conditioning in this room would create options for visitors. I would like to thank you for your nice review and advise in return that your proposal relating to the addition of an extra air-condition in the third room (children's room) has been implemented, meaning the whole property is fully air-conditioning from this summer going forward. Undoubtedly, our visitors' comments and suggestions are always very welcome and useful for the improvement of the services we offer and also for the better stay of our guests. 1) με πλοίο μέσω του λιμανιού της Ραφήνας (1 ώρα στο πλοίο και 15 λεπτά οδήγησης). 2) με πλοίο από το λιμάνι του Αγ. Μαρίνα (45 λεπτά στο πλοίο και 45 λεπτά οδήγησης). 3) με αυτοκίνητο που διασχίζει τη γέφυρα της Χαλκίδας (τρεις ώρες οδήγησης συνολικά). Η Κάρυστος είναι ένας ιδιαίτερα προτεινόμενος προορισμός διακοπών λόγω της εγγύτητάς του με την Αθήνα, τα γραφικά του τοπία και τις καθαρές κρυστάλλινες παραλίες της. Στο κέντρο της πόλης υπάρχουν πολλές παραθαλάσσιες ταβέρνες, ουζερί, καφετέριες και μπαρ, που καλύπτουν το γούστο όλων. Αυτό το ακίνητο βρίσκεται περίπου. 6 χλμ. Από το κέντρο της πόλης. Rates differ throughout the year basis low/mid/high season. For an accurate rental quote please enter your preferred dates in the calendar and/or send us your request. The rate appeared on the right section of this platform is only an estimation/average per night and does not necessarily reflect the applicable rate for your preferred dates. Refundable security/damage deposit is required for all bookings. Reservations for more than 9 nights receive one-time complimentary coffee capsules, juices/soft drinks, one bottle of wine, beers and traditional light delights.